Citation Information: J Clin Invest. 2018;128(8):3568-3582. https://doi.org/10.1172/JCI99888. The mechanisms of pain induction by inflammation have been extensively studied. However, the mechanisms of pain resolution are not fully understood. Here, we report that GPR37, expressed by macrophages (MΦs) but not microglia, contributes to the resolution of inflammatory pain. Neuroprotectin D1 (NPD1) and prosaptide TX14 increase intracellular Ca2+ (iCa2+) levels in GPR37-transfected HEK293 cells. NPD1 and TX14 also bind to GPR37 and cause GPR37-dependent iCa2+ increases in peritoneal MΦs. Activation of GPR37 by NPD1 and TX14 triggers MΦ phagocytosis of zymosan particles via calcium signaling. Hind paw injection of pH-sensitive zymosan particles not only induces inflammatory pain and infiltration of neutrophils and MΦs, but also causes GPR37 upregulation in MΦs, phagocytosis of zymosan particles and neutrophils by MΦs in inflamed paws, and resolution of inflammatory pain in WT mice. Mice lacking Gpr37 display deficits in MΦ phagocytic activity and delayed resolution of inflammatory pain. Gpr37-deficient MΦs also show dysregulations of proinflammatory and antiinflammatory cytokines. MΦ depletion delays the resolution of inflammatory pain. Adoptive transfer of WT but not Gpr37-deficient MΦs promotes the resolution of inflammatory pain. 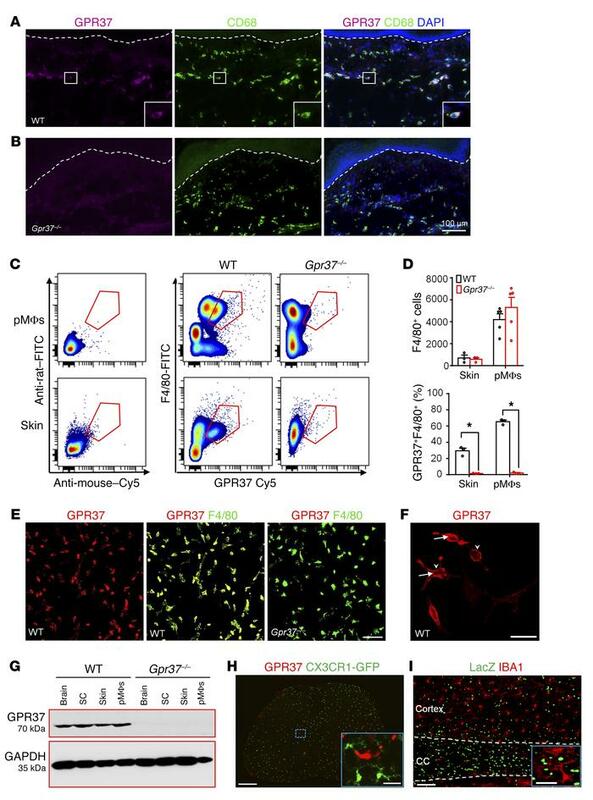 Our findings reveal a previously unrecognized role of GPR37 in regulating MΦ phagocytosis and inflammatory pain resolution. GPR37 is expressed by MΦs, not microglia. (A and B) IHC showing the colocalization of GRP37 and CD68 in the hind paw dermis of WT (A) but not Gpr37–/– (B) mice. Boxes in A indicate an enlarged cell. Blue DAPI staining labels all nuclei in the skin. Scale bar: 100 μm; 45 μm (original scale in inset). (C and D) Flow cytometry showing GPR37 expression in F4/80+ MΦs from hind paw skin and pMΦs from WT and KO (Gpr37–/–) mice. n = 3–5 mice/group. Data represent the mean ± SEM. *P < 0.05; unpaired t test. (E) Double staining showing GPR37 IR in F4/80+ pMΦs. Scale bar: 100 μm. (F) Confocal microscopic images showing cytoplasm (arrows) and surface (arrowheads) localization of GPR37 IR in pMΦs. Scale bar: 20 μm. (G) Western blot showing a single band of GRP37 in lysates of brain, spinal cord (SC), hind paw skin, and pMΦs. Note that the band is absent in Gpr37–/– mice. (H) Double staining showing no colocalization of GPR37 with CX3CR1 in the spinal cords of Cx3cr1-GFP mice. Scale bars: 250 μm and 20 μm (inset). (I) β-Gal staining showing no colocalization of LacZ (Gpr37) expression with IBA1 in brain sections from Gpr37+/− mice. Scale bars: 100 μm and 20 μm (inset). CC, corpus callosum.